A strange viral infection swept over the web last week. Its aim was to eradicate reason and individuality and manifested itself in multiple blog and social network photos of people in compromising poses, nibbling on Magnum, the newest carrier of forbidden calories. Gone were the pictures of cute babies; adorable cat videos; photos of breakfast, lunch, dinner; Foursquare invitations to stalkers and the constant rants against life's unfairness. When there's just a constant stream of gold labelled ice cream wrappers, you suddenly miss the creepy insights into your friends' personal lives, whereabouts, mental issues and digestive habits. I've been told that in other cities, the infection is much worse. Elated by the idea that perceived elevated social status can now be bought, urban peacocks take pictures in very public places of before, during and after they consume the ice cream bar. Magnum is reportedly a status symbol, but what kind of a status symbol is something that's accessible to everyone? Aren't status symbols, by their very nature supposed to be too expensive or too rare for the average Joe to have? 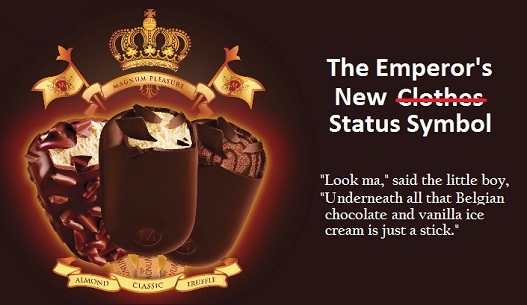 I therefore suggest that Magnum should be declared a status symbol for the average social status. In the interest of giving a fair(ly) biased assessment of Magnum, I had to try it. Surprisingly, it was harder to find than a haystack with a needle. It was out of stock in three stores and running out in another, as if people bought them in crates, afraid that if they ran out of it they'd look ordinary, cheap or poor. For my first bite, I closed my eyes like the TV ad model demonstrated, but there was no consequent awakening to an adoring crowd celebrating my newly discovered royalty. There was only the realization that the name Magnum is a glaring mismatch for a sweet product. It's a more appropriate name for a mastiff, an action movie or a UFC fighter. Somehow, "Hype" has a softer, more fitting sound. What was the taste like? Nido full cream milk seemed a tad creamier than the vanilla filling. As for the Belgian chocolate coating, I'm not refined enough to tell the differences among Belgian chocolates, Hersheys, M & Ms and ChocNut, so the distinction was lost on me. In less than five minutes, all that supposed Belgian superiority was in my digestive system anyway, mixed with the salted dried fish I had for lunch. All I had left was a branded stick. Oh good, I could either have it framed or carry it around to flash in the faces of random strangers. The craze will subside soon... I just love their marketing power and it really did work. I can smell your sarcasm all the way from Cebu, and because you're one of the many honest reviewers of this dairy bandwagon, I might as well not wish to try Magnum. The brand name itself speaks of a high status symbol but its TV commercial does not. the STICK... its name tag. It all because of the marketing strategy and the celebrity endorses that makes magnum a sensation .until now ,i haven't tried it yet. been trying to get me some twice but the first one , i grabbed the blue bell instead and my 2nd attempt did not happen too because i saw the mouth watering box of Haagen Daz ice cream cone next to magnum so, hahaha.probably on my next grocery shopping,we will see. Ha ha ha! I had the stick framed lol! joke! You have a funny way of writing! I can imagine people flashing the branded stick on other people's faces ha ha ha! For me, Magnum is not delicious. Pinipig crunch is much much better! I'd like to congratulate the marketing arm of Selecta he succeeded in awakening everyone's curiosity to try Magnum. I actually like Magnum Almond. The Belgian chocolate coating is really something. But yes, I definitely don't understand why people go gaga for a mere ice cream bar. Sigh. Marketing is really powerful. lol the marketing worked, they said. so the marketing's aim is to make it a hype for two or three weeks max and kill it with a strange death? good marketing.